As leaders in the field of metal-to-plastic conversions, we are continually identifying opportunities to assist our customers with improving the performance while reducing the cost of components currently produced in metal. 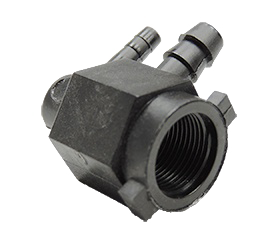 At K&B Molded Products, we manufactured the nozzle adapter highlighted here for use in a forced-air fuel oil heater. While on a site visit to an existing client facility, we noticed an aluminum assembly on their factory floor that was an ideal candidate for conversion. Machined and then drilled and tapped to accept two brass barbed ferrules, we ascertained that we could mold the part at a significantly reduced cost while also eliminating the need for the secondary threading operations. This project presented several challenges. Prototyping revealed that when injection molded, the thick walls of the 1.0” hex shaped body left sinks, which led to difficulty holding the close internal tolerances. Our engineers resolved the issue by reducing the hex dimension to ¾”, which allowed us to achieve precise dimensional accuracy without interfering with part functionality. The challenge to our tool makers was to form the internal threads in the main body and core the small side holes for the hose barb ferrules, all while keeping the holes open and free of flash. After finalizing part geometry, material selection, and tooling, we injection molded the parts using glass-reinforced, high heat nylon 6/6. The final part featured overall dimensions of 1.312” in length x 1.375” in width x .875” in height, and we upheld very close ±.002” tolerances. The client was very impressed with the results, and especially pleased with the 90% reduction in cost when compared to the original machined aluminum version. Current production continues at the rate of 5,000 to 125,000 units per year.